Sarah Bazley, Learning Manager for Chester Zoo explains the importance of the Wild Winter project in encouraging children to learn about UK wildlife. “It’s always a challenge to keep youngsters actively engaged with the great outdoors. With things like TVs, computers and tablets being so accessible for children now, it’s not a surprise that many reports, including some carried out by the National Trust and the Wildlife Trusts, highlight a concerning lack of engagement between young children and nature, and how this disconnect impacts their physical and mental wellbeing. “The Wild Winter project at Chester Zoo was designed to give children an opportunity to engage with British nature. Running throughout November and December last year, Wild Winter is an interactive, immersive experience, set in a moonlit forest. Each child is armed with their own torch and are challenged to find the creatures hiding away in the undergrowth. 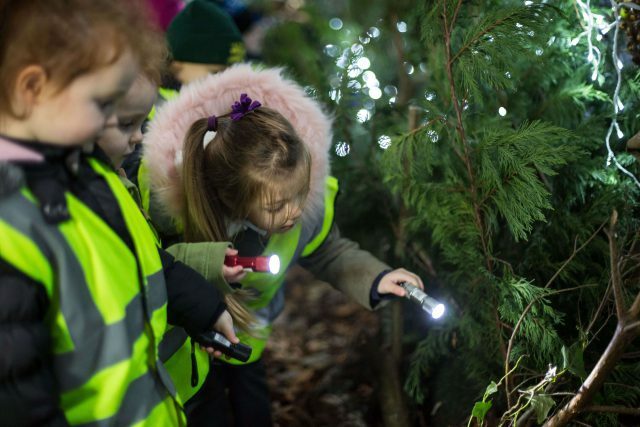 With an expert guide helping identify the animals in the forest, the children also learned about the migration, hibernation and feeding habits of each creature and how they can help animals that come into their own garden survive during the harsh winter months. The experience ended with the children learning how to make bird feeders which they could then take home with them afterwards. “We wanted each child to go home with a greater understanding of the nature that they are surrounded by and an interest in how to protect wildlife. We also wanted to spark an interest in the outdoors and encourage children to get out and connect with the natural world. We have had an overwhelming amount of positive feedback from the children themselves, as well as the parents and teachers who visited the experience. “Part of the funding for Wild Winter was provided by the Fun2Fund donation programme, part of the SeaWorld & Busch Gardens Conservation Fund. One of the main priorities of the SeaWorld & Busch Gardens Conservation Fund is to combat nature deficit disorder and get more young people engaged with nature. “At Chester Zoo, we invest heavily in charitable objectives including projects to conserve the living world and educate people on major conservation issues. Scientists believe a third of all animal and plant species on Earth face a high risk of extinction within this century, so Chester Zoo’s work is extensive. With this activity, however, comes the need for financial support. Without vital funding from donation programmes such as Fun2Fund we simply wouldn’t be able to run additional events and educational experiences like Wild Winter which are so important for the local community.